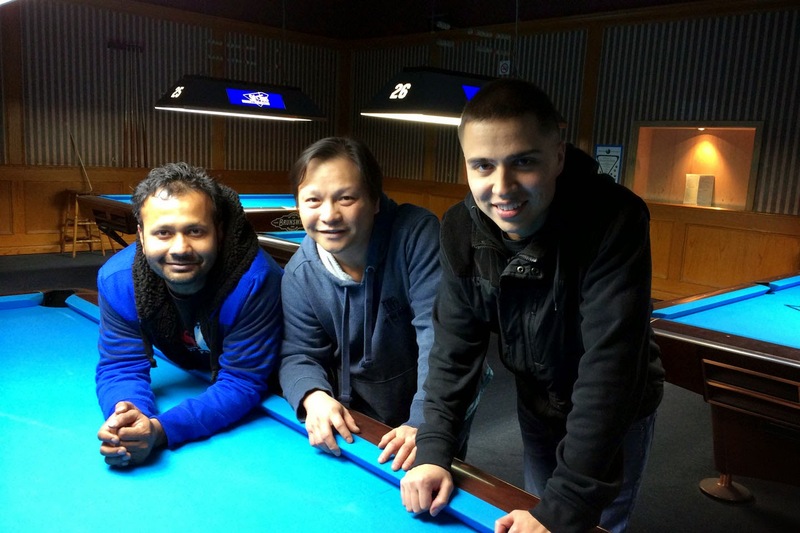 The 3rd event of the 2014/15 ‘404’ series took place this past weekend (November 29 & 30th) at the Shooters Snooker and Sports Club in Toronto. The 404 continues to be a popular tournament for GTA players and beyond with participants from as far away as Orillia and Columbus, Ohio making the trek to compete in this tournament. It is also satisfying to see the mix of regular 404 players and players new to tournament competition at this level participating in the 404 series this year. The tournament was ready for a full field of 64 players on Saturday but was forced to settle for a field of 60 after ‘no-shows’ failed to inform the tournament organizer that they would not be attending thus preventing players on the waiting list from participating. After play concluded on Saturday, Jehlar Fernandez, Sumon Sarkar, Ben Chang, and David Maung were undefeated on the ‘A’ side while the ‘B’ side had Bernie Fulford, Edmund Chow, Carlin Sanderson, Ian Argue, John Morra, Rob Hall, Tony Hong and Greg Plester returning for Sunday play. When the dust settled later in the day on Sunday, Sumon Sarkar had gone undefeated to capture the ‘A’ side title while John Morra and David Maung were left to contest ‘B’ side bragging rights. Morra prevailed against Maung by a 12-1 score as Morra’s game only got stronger as the tournament progressed. In the tournament final Morra again dominated his opponent by defeating Sarkar 11-2 to claim the tournament title. Congratulations to John Morra on his 404 tournament win --- his first of the 2014/15 season. Despite a more challenging handicap system in the 404 series this year and a loss in his first match of the tournament, Morra persevered and won 11 consecutive matches to win the tournament. While there may have been some uncharacteristic missteps by some of his opponents in the later rounds when they had him “on the ropes”, that does not diminish his accomplishment in any way. His early loss did not discourage him and he performed some old fashioned “grinding” to earn the tournament title – a trait that he obviously inherited from his father. Canada is well represented by John Morra on the world stage. John is off to the Philippines later this week to compete in the Manny Pacquiao Cup. Good luck John! Thanks to those who participated and apologies to those who were unable to play as a result of the high demand for entry to this event. The wealth of new players to both the 404 and the Shooters Amateur Event as well as the full fields at both events is primarily due to the efforts of the Shooters room owner who has expended significant effort to contact players, follow up with these players and follow-up again to ensure that the players will be attending the event. And although guidelines need to be further tightened to better manage the privilege of pre-registration, this pre-registration has been largely successful in attracting players and ensuring full fields for the events at Shooters this season. The next Shooters ‘404’ will be held December 13 and 14th.